One of the surest signs of Auckland’s housing market being in bubble territory is that house prices are now way out of whack with not only incomes, but also rents. This proves that the issue is one of demand for housing as a tax-free investment, not simply supply. The only way to fix this problem is to tax the effective income from housing. In the mean time, this raises the question – why not rent rather than buy? Owning our own house is considered part of the Kiwi dream, but it is not clear why – apart from the tax benefits of course. There are many claimed social benefits from people owning their own home, but they don’t stand up to close scrutiny. There are plenty of other countries where home ownership is lower than in New Zealand, yet they are ahead of us on many social indicators. Is the Auckland housing market a bubble? We already know Auckland houses are increasingly unaffordable – in fact it is the tenth least affordable city in the world with prices that are over eight times the average annual income. But that alone doesn’t prove there is a bubble – after all it could show that the supply of housing is severely constrained (as the Government claims). A more certain sign of the market entering bubble territory comes from one of New Zealand’s foremost economists; P.C.B. Phillips. He is the guy that first noted that inflation creates jobs – at least for a little while. His latest paper tests whether Auckland is in a bubble. The answer is yes – starting in about 2013. One of the key measures Phillips uses compares house prices with rental return. He and his colleagues find that Auckland’s rental return is now below 3% – a terrible deal in anyone’s books. That is a nominal return – before depreciation and other costs such as rates and insurance. Once you take inflation into account these investors would certainly be better off putting their money in the bank, and are probably making a loss. This is a sure sign that investors buying now are doing so not for rental return, but because they expect house prices to keep going up, as they have for the past 45 years. That shows the key problem isn’t supply of housing as many claim, if the problem was lack of accommodation then rents would be rising too. Instead the driver of price rises is the demand for houses as a source of tax-free capital gain. Given all the attention around the Auckland housing market, prices will probably keep rising – until they don’t. Such is way of bubbles. Well no, actually. If someone else wants to own the house and is prepared to accept a rent of 3% of the house value in return, they are actually doing you a favour. At that rent you aren’t paying their whole mortgage. They will still be paying some of their mortgage too. And remember most of those mortgage payments would just be going to the bank, rather than paying off the house. Well yes, but rents are less than a mortgage would be for the same house. If you rented and invest the money you save, you might end up with more than the value of a house. Why are we so obsessed with home ownership? There are many claimed benefits of home ownership, which seem to have convinced us that it should be the right of any Kiwi to own their own home – assuming they want to that is. But how real are these benefits? Home-owners are happier, but that isn’t really surprising since they also tend to be richer. They also move around less than renters, which is also not surprising. However, this more stable lifestyle leads to other social benefits, such as getting more involved in the local community. That is probably the strongest reason to support the idea of everyone owning their own home. There are other claimed benefits – such as home ownership reducing crime rates. While it is true that areas with high rates of home ownership have lower crime rates,that doesn’t mean the home ownership is the cause. These sorts of links are complex and very difficult to untangle. Of course, the greatest benefit of home ownership is actually the tax advantages that come with it. Is this the real driver behind our cultural obsession with investing in housing? If so, it is an expensive one. The lack of taxation on housing distorts the investment in our economy, drives up inequality and ultimately shifts the tax burden onto other taxpayers – particularly PAYE wage and salary earners. Ironically, if we want to increase home ownership, the OECD points out that one of the best things we could do is tax the effective return on house ownership. The OECD points out that tax loopholes around housing tend to get exploited by the rich, which drives up house prices and puts them out of reach of those on limited incomes. New Zealand shares its obsession with home ownership with many other Anglo nations, but this isn’t the case everywhere in the world. In many parts of Europe, long term renting is the norm. These nations often have strong laws to support the rights of renters, however, there is nothing to stop people asking for long-term agreements in New Zealand. Many landlords would appreciate the certainty of a long-term tenant. There are many very advanced nations with lower home ownership rates than New Zealand – such as Germany and Denmark. These countries seem to handle lower rates of home ownership without their social fabric falling apart. That is probably because they have long-term tenant arrangements that provide the same level of social stability and engagement in the local community. Is owning your own home really part of the Kiwi dream? Should we be worried about falling rates of home ownership in Auckland? It really isn’t clear that a society where people own their own home is any better off than one where people don’t. Regardless, if encouraging home ownership is our goal, having tax breaks on housing are not the way to do it. If you were a renter in Auckland over the last 3 years have on average missed out on at least $200,000 plus of equity increase. Property is always running in cycle, history shows it will be 8 to 10 years in Auckland. But unless you are pychic and sell at the right time u will likely be giving that 200k back over the long term, that's how bubbles work. depends on where you're realising your gain. If you can moneytise the increase through rent increases (as a %of building market value) then you'll be increasing your take. Connect that with diversification (using the increased price as extra security) to enter into a child investment, you could have the initiation energy to get the child investment into a cashflow acceptable position when the market rebalances - if you play your cards right the second investment will offset the loses of the first. Though I think he was wildly conservative on the amount raised . Cheers : the Gummster . Supply is main thing from the history. TAX is not working well when supply is over demand. So many under estimated the ability of our builders, they will build heap of house/flats/apartments in next two years. And then some builders will be loss their shirts. Rents have started to go up... Who knows what rents will do over the next 5 yrs..?? The Ireland experience is a good one.... House prices were out of whack with incomes and rent AND this was in the face of a massive building of NEW homes.... AND...it was in the face of Massive increase in credit... in lending to the property Sector. For Gareth to suggest that what might appear to be a bubble , is simply caused by the...."demand for housing as a tax free investment"... .. seems very myopic and biased in my view..
My question to Gareth is..... Since there is a fundamental Law of Supply and Demand.... As the price of Houses has skyrocketed in Auckland.....where is the large increase in Supply that should happen when prices increase dramatically......????? There is no sign ...at all ... of a meaningful increase in supply..?? new Supply is not even at 2001 levels..??? Housing supply is keeping pace with population growth, and the trend is upwards. There is no 'fundamental law of supply and demand' what people call a law is more like a principle, it's what you could expect, but no guarantee of anything at all. Case in point oil or dairy, demand is down and supply is growing. Your reasoning that it can't be a bubble because rents are not falling, doesn't make any sense. A bit like Jon Key saying it's not a bubble because prices are rising. The Ireland example is instructive, as are the many other housing bubbles throughout the world. The one common denominator was the unfailing belief that house prices never fall. Reasonably enough, if you believe that, then the best time to buy is ASAP, and buy as many as you can because the price can only go one way. It's classic FOMO, fear of missing out. You can look at the data which shows that investors are starting to dominate the market, making leveraged bets, with the full faith that house prices can never fall. The rents don't cover the outgoings, so the negative cashflow has to be offset by monetising the capital gains. The supply that matters is the number of listings for sale (not actual number of houses). when bubbles correct everyone sells at once, effect is 5x-10x supply increase in very short time (note this has nothing to do with building new f'n houses!! ); that causes the change in supply-demand balance that sees prices crash. If u trade shares you would have seen this exact thing play out time and time again. Xero share price is a high profile example of this. Fundamental values are steady, weighted things, market values are volatile 'voted/emotional' things. Good point, it's all about the flow, not the stock. One definition of a "Bubble " is.... "A run-up in the price of an asset that is not justified by the fundamental supply and demand factors for the asset.. "
In that respect... falling rents might be an indication of oversupply or a lack of fundamental, intrinsic demand... which might suggest the likelihood of a bubble. . ie ..massive price rises in the face of this. Oil and Milk are great examples of the economic law of supply and demand at work. the collapse in commodity prices was, somewhat, forseeable.... Chinas response to the GFC was massive credit growth within the Private Sector. 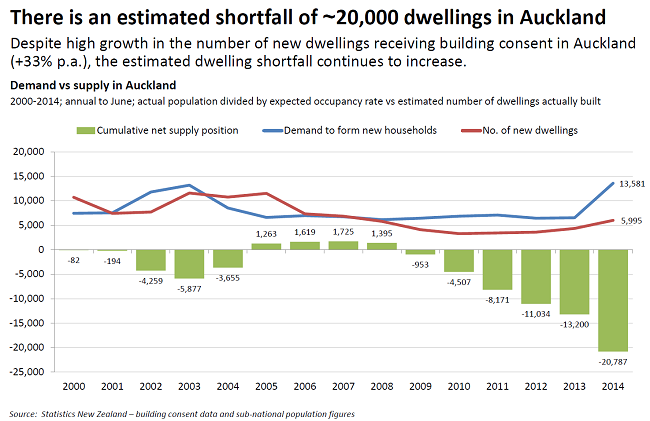 Can u point me to where it shows housing supply is keeping up with population growth in Auckland..?? thks. If the downturn in dairy prices was foreseeable, then so is the downturn in Auckland housing. A bubble is when people notice a run up in prices, then buy anticipating further gains, which is Auckland exactly. People are in now way buying for rental yield, or because buying is cheaper then renting. Gareth Morgan says this, "One of the key measures Phillips uses compares house prices with rental return. He and his colleagues find that Auckland’s rental return is now below 3% – a terrible deal in anyone’s books. That is a nominal return – before depreciation and other costs such as rates and insurance. Once you take inflation into account these investors would certainly be better off putting their money in the bank, and are probably making a loss." I think this is a seriously flawed and simplistic analysis, which first assumes that people buy a house purely on the basis of optimal financial calculations, which doesn't take into account intangibles, which influence the buyer's decision. Factors such as the security provided by investing in a tangible asset, the sensation of feeling settled that home ownership confers, the independence of homeownership, because you are not at the mercy of the arbitrary predilections of a landlord who may decide to sell the house from underneath you. You can alter and configure the house so that it suits your needs rather than shaping your lifestyle around the limitations of the house's design, which you had nothing to do with. I'm actually disappointed and even appalled at this analysis which I'd characterize as facile and even misleading, because it appears to be represent a meme designed to habituate and furthermore glorify, the prospect a whole generation will never own their own home. I personally think its an extension of the mantra of worker flexibility, the idea that workers must be mobile, continually upskilling and responsive to the needs of capital. Its what the corporate, government, and academic bureaucracy is demanding of us in the modern world and the notion of having a stable, long term living situation is fundamentally at odds with this. I think Bernard or whoever owns the site now, needs to require people who are providing advice in this media to declare their pecuniary interests, so we can make an informed decision as to whether they are offering advice to suit their own financial strategies. I do not mean to besmirch Gareth's integrity, but after the global financial interests I have become suspicious of people who make recommendations in the public domain which could influence people's investment decisions. The majority of buyers are investors, so the comparison is valid. It shows that investors are not doing basic math, but buying emotively. It is fair to say that investors are making financial decisions. I think you wouldn't have said that before the government decided to deregulate the financial system in the 1980s. People bought a house to live in it, not to make windfall capital gains. In the 1980s however we didnt have foreign investors. Now we can be unsure how big an impact that is in NZ but when you look around other capitals in the world you can see the upper segment of these cities at least have all gone crazy in value as well. It is a pity we lack so much data because it leaves us guessing. This video made by the producer behind the Four Horseman documentary features an interview with a very successful property investor, a guy known as the King of Buy to Let. He now owns 900 houses in the UK. That's houses, not flats. He epitomizes the psychology and attitude of all his ilk as he appears not to acknowledge the damage that he wreaks on the the wider economy and the lives of people who are excluded from homeownership because the disparity between their income and absurd real estate inflation. He also describes his investment strategy, which I really stood out for me. Essentially what he does is he bids at an auction for a property which he deduces is undervalued for whatever reason, goes to the bank for credit on interest only terms, secures tenants of which there are an abundant supply, because the savings and income of most people is inadequate to pay for inflated house prices. He collects rent from the tenant and pays the interest cost of his property and maybe a little on the principal of the loan to build equity and waits for the real estate value to appreciation. When it rises sufficiently for him to make a satisfactory return he sells the property and in the meantime he has accrued some equity, paid of the loan, and receives tidy profit from the capital gain with very little effort on his part. Does no one else see the distortionary effect of such a strategy? In the interview he appears unwilling to concede it may at all be harmful and contends its good for the economy. I am sure there are many in this country who are of a similar mind and even proclaim they are providing a public service. So you agree with me that only small business should be allowed, and large companies (like K-Marts, McDonalds etc need to be capped to protect fair jobs across the market :) ) Rental housing is just another business. Iron ore milk and oil are all commodities that are used up. I.e stop making more and eventually the world will have zero stock of them. Property is more a kin to gold as it's not used up. bottom line is this: auck house prices would have fundamental basis and the shortage theory would have merit only if rents had kept pace i.e rents up 10-15% p.a last few years as well. This hasnt happened therefore the price rises over and above the 2-5% rent increases we have seen are due to speculators and the temporary increase in demand from people wanting the cap gains. Prices will eventually fall into line with rents. I think word you might be looking for is "consumables" not "Commodities". commodities are very common or (older meaning) component parts to other goods. Consumables are literally "that which gets consumed (ie used up)". bottom line is this: auck house prices would have fundamental basis and the shortage theory would have merit only if rents had kept pace i.e rents up 10-15% p.a last few years as well. I dont agree.... just as a pe ratio does not , in itself, determine if a share is overvalued , neither does the rent/price ratio tell you that... You need to have alot more information. Also... there is no mechanical relationship between prices and rents.... If there is a shortage of rental properties ...then rents will go up, at some point.... As far as I know rents have started to go up...???? Roelof, we have talked about supply and demand before. That is my rework of the Quantity Theory of Money. That theory is modelling supply and demand, I just adjust it for interest. So you if are going to use that law then consider it in full. In this discussion you could insert houses instead of money, as houses now have some of the qualities of money, or have become money like. PE is pretty much the gold standard of determining is a stock is over or undervalued. When the PE ratio is out of line it is normally due to SPECULATION; gambling that current income is going to change. I know this from a few examples of personal experience investing in oil and gas exploration companies as a younger, more foolhardy lad. They have in most cases very small income, yet cap values fairly high due to licences owned where if drilled MIGHT provide the extra income required to justify the cap value; So PE ratios very high for these. Unfortunately, property can only provide rent returns and doesn't have the potential in most cases to double or tripple the rent over the short term. In A FEW cases in Auckland, a house with land might sell for a very high PE (yield of 3% or lower) due to speculation (or insider knowledge) that re-zoning will mean potential income may double, tripple etc as one dwelling becomes 2, 10, or more. Whats the PE on a modern dairy farm? c.f. Auckland houses. It used to be 4-8% return on asset or a PE of 12.5-25. This year the PE will be much, much higher. not nearly as high as the present value of a dollar if rates are 4%. " I have not figured out the consequences of -ve bond yields in Europe..??? Will European money come to NZ and lower yields on assets over here..??? If so.... too what crazy level..????? Does anyone have an answer...?? I suggest all builder need to careful about over supplying in next 2 to 3 years. Don't be so confidence when every else is making money. The day will coming very quick like 1976. I forgot to add.... Maybe the disconnect between incomes/rents and House prices has more to do with the fact that Auckland is in the process of becoming Global City... It is showing the characteristics of a Global city. Come on Gareth ...move past your fixation of the problem being just the ..." tax free investment status of Housing.."
thats why the powers of law and council should be making sure that incoming money/investment pays for "strategic improvement" of Auckland. from your own link "For example, existing superstar cities and towns could moderate their housing costs by allowing increased density, but have chosen not to "
So if you think that despite public uproar about the cost of auckland property, that no increased density and supply response in auckland will happen, then go ahead and buy more as it might fall into the cat. of these 'superstar cities'. The problem of inelastic supply has only clearly been identified recently (last 10 years..). Your brave or stupid to think Auckland is going to be allowed to grow like these US cities were over last 30 years. The only justification for paying todays prices in auck is the assumption that this sort of growth with inelastic supply response will inface occur. Gamble if you like.. I love this renting is better than buying nonsense. House Prices rise long term or at least for the last 45 years they have done so. You buy as a long term investment, yes yields may start low but they rise and as you repay capital the mix changes and slowly the investment becomes self funding. There is no get rich scheme unless you buy and flick it 12 months later in a rising market. This is a completely different market than any I have known for the last 45 years. We have historically low interest rates, record number of immigrants, overseas investors buying houses, every houses in Auckland sold at auction and a Government determined to look the other way with housing. We are definitely in uncharted territory now. As prices go up more investor want some of the action and are pouring their money in rental properties exacerbating the problem. After carefully studying all the fundamentals of housing, I am sure house prices will be worth less in 2 years than they are today. People do want to know this and are like lemmings, all following each other to lose their life savings. .. if you're going to make such claims against Gareth maybe you ought to supply your real name , and not hide behind a nom-de-plume ! that would open the person to a legal battle, as it is they can trace the IP of the post. One only has to read aposters comments and compare it against the market to know whats really going on. We did it to Gordon, so I doubt Gareth should get a free ride. To anyone who actually knows anything about property it is clear who's who. But for people who don't know, or people impressed with bylines or big names, they get taken in by such foolishness, but whats worse they spread it around - and their cab driver tells someone...and that someone reads an article that goes back to this article and they believe it. And they doubt the truth. Not knowing how to do the calculations themselves... and in doing the calculations and finding the information at great odds to what was declared here, they question themselves. The Sherriff would have to be held accountable should he leave up that poster. And the gent that asks for it to removed, needs to do so for if he does not, it is grounds for the libel case to be dropped. However there is also one other important factor: The poster claimed "special knowledge" that he had worked alongside the in question gent, this indeed is a serious claim and also pressures that credibility issue. That there is "special knowledge" claimed would place the sheriff in a tight position. There is always a question of public good, but seldom does the judge allow that defense and generally only for immediate and outstanding danger, where normal channels cannot be accessed in time. for if real evidence and danger exist the court believes it has ambulances at the base of all the cliffs and an individual has no rights to warn others. Which is why we must be careful of announcing businesses like the 656 groups, and report only their actions, and only make baseless or generalised accusations. The other thing which I should have mentioned is the victim would have to show loss attributable to the act.... something which the Sheriff does ignore in order to try and keep a friendly atmosphere at the Bar-room. Foreigners buying houses in Victoria will be slugged with a $330-million tax, under a radical STATE budget plan to force international investors to pay "their fair share". Under the highly controversial move, foreign nationals - many from China - will pay a new tax equivalent to 3 per cent of the purchase price of houses, raising $279 million over four years. That means a Chinese national buying an $800,000 property will pay an extra $24,000, in addition to $43,000 in stamp duty charges. Foreign housing investors will also pay an extra 0.5 per cent in land tax from 2016 on new and existing properties, raising $53.5 million over four years. And we wonder why the Chinese are pouring into Auckland. Canada are doing the same, because of the absurd appreciation of housing prices in cities such as Vancouver. No cowboy, we are experiencing an influx because Canada is now imposing restrictions on immigration. They can't go to Australia or Canada, and we're also a backdoor to Australia once they get citizenship. With steps being taken by both Central Govt and Victorian State Govt you have to conclude the problem is more serious than previously revealed. Gareth is glib, but not smart. eg. "The only way to fix this problem is to tax the effective income from housing." a. Immigration. Ban purchase and ownership by non citizens. b. Stop the subsidies Aucklanders get over the rest of New Zealanders via the accommodation subsidies. These nations often have strong laws to support the rights of renters, however, there is nothing to stop people asking for long-term agreements in New Zealand. Many landlords would appreciate the certainty of a long-term tenant. All true, but the kangaroo court known as the Tenancy Tribunal mitigates against it working. More push to lock in customers. We need the freedom of choice of small business more than ever to avoid such monstrosities. This proves that the issue is one of demand for housing as a tax-free investment, not simply supply. Show me the proof. As a counter-argument, show us it is not. Otherwise if you look at Chch which saw rents as well as house values climb that given the circumstances pretty clearly shows a lack of supply. When you look at the best suburbs in Auckland these are the ones that have seen the biggest gains by far? yet FHB's would not mostly be buying in these areas. Ergo there is a degree / % of various factors going on, the only unknown is what % to which. I have done so several times. I have yet to have even one person give a bona fide example of how it is "tax-free" that doesn't involve illegal activity. "He is the guy that first noted that inflation creates jobs" LOL, how very Keynesian of him. Go have a look at the UK Labour Govn's trial in the 1970s to create employment using 'some" inflation. If I recall correctly it worked a little, however after a while employment actually started to decline as inflation took off. Pretty much anything by Gareth needs to be treated as excellent Satire. If libel was an issue Phillips would be suing for inclusion in one of Gareth's satires. If Phillips theories weren't so terrible to start of with. A classic case of an academic measuring backwards then find a formula to fit. "inflation" does not create jobs, which is clear for anyone who actually has to work for a living. Otherwise ancient Egypt and third world would have no jobs...(no inflation) but they have plenty of jobs...just no private wages, so no inflation. Wages causes economic growth, as that gives purchasing power. purchasing power equals trade. that doesn't automatically create inflation but the rising demand does. typical economist see a correlation, get the causation backwards. Actions speak loauder than words - Do you rent or own Gareth? The reason you are not clear why is because you are out of touch. Look at retired people. Those who own there own home have no rent/mortgage to pay and survive. Those retired people who rent are struggling. Gareth your talking rubbish, I bought a house in about 2005 just before the "Crash" and have never looked back. Having worked hard on a single income with up to 80% of my income at times going on the mortgage and finally paying it off last year I'm now in a position where just like you, "Working" is optional at age 48. Paying rent is and always has been a mugs game, sure its now harder than its ever been to own a house, but life is about choices and living within your means if you intend to get ahead in the long term its just hard work plain and simple so its your choice. Certainly seeing things like this must worry people rushing to get into the Auckland property market with very little equity - http://www.nzherald.co.nz/business/news/article.cfm?c_id=3&objectid=1144... .